ISC Pulley Phlotich Black with Bushings 30kN 1/2" Rope Max. 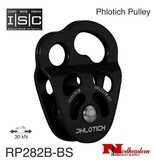 Home / Pulley Phlotich Black with Bushings 30kN 1/2" Rope Max. ISC Pulley Phlotich Red with Bushings 30kN 1/2" Rope Max. ISC Pulley Phlotich Orange with Bushings 30kN 1/2" Rope Max. ISC Pulley Phlotich Gold with Bushing 30kN 1/2" Rope Max. ISC Pulley Phlotich Purple with Bushings 30kN 1/2" Rope Max. ISC Pulley Phlotich Gray with Bushings 30kN 1/2" Rope Max.